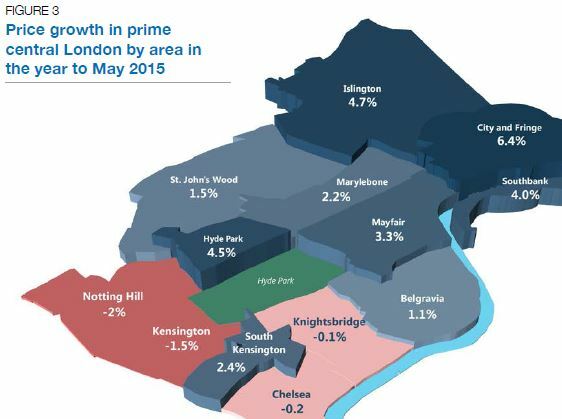 Several weeks after the general election produced a majority government and eliminated the possibility of a ‘mansion tax’, annual growth in prime central London is lower than at any point since before the general election in 2010. Though prices grew 0.3% in May, an annual increase of 2.3% is the lowest since November 2009. This relatively low level of growth underlines the gap between the expected impact of the result and the reality of a property market still digesting a series of tax changes. Despite the fact annual growth continued to slow in May, it is worth noting that six-month and quarterly growth were at their highest point in 2015, suggesting the current slowdown is bottoming out, as figure 2 shows. One of the key reasons growth remains subdued is the market is still absorbing increases to stamp duty for properties worth more than £1 million. The changes came into effect in December but activity has slowed since the start of the year due to the election. The stamp duty change came on top of a series of other tax revisions including to capital gains tax and the annual tax on enveloped dwellings. All of which followed an exceptional period of growth during the financial crisis. It underlines how the notion of a sudden return to doubledigit annual growth or any sense of ‘business as usual’ is unfounded. 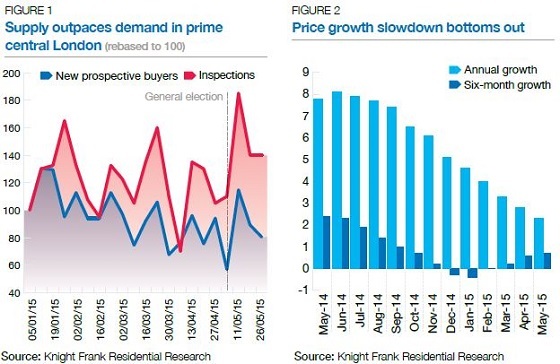 There has undeniably been a release of pentup demand in recent weeks but while some vendors may expect an ‘election premium’, buyers have not responded in a similar way. The number of new prospective buyers spiked in the week after the election following a lull during election week. However, new property inspections, a lead indicator of supply, have risen by a greater degree than the number of new prospective buyers since January, as figure 1 shows, an imbalance that will weigh on asking prices. Furthermore, against the background of affordability concerns in the wider London market, high-value property is still subject to political measures. Reform of the council tax system and the abolition of the more arcane aspects of the non-dom rules are two areas of potential focus. Additionally, the referendum on EU membership and the London mayoral elections in 2016 are further areas of uncertainty. The Knight Frank Prime Central London Index, established in 1976, is the longest running and most comprehensive index covering the prime central London residential marketplace. The index is based on a repeat valuation methodology that tracks capital values of prime central London residential property. ‘Prime central London’ is defined in the index as covering: Belgravia, Chelsea, Hyde Park, Islington, Kensington, Knightsbridge, Marylebone, Mayfair, Notting Hill, South Kensington, St John’s Wood, Riverside* the City and the City Fringe. ‘Prime London’ comprises all areas in prime central London, as well as Barnes, Canary Wharf, Chiswick, Clapham, Fulham, Hampstead, Richmond, Wandsworth, Wapping and Wimbledon. * Riverside in prime central London covers the Thames riverfront from Battersea Bridge in the west to Tower Bridge in the east, including London’s South Bank. The City Fringe encompasses the half-mile fringe surrounding most of the City including Clerkenwell and Farringdon in the west and Shoreditch and Whitechapel in the east. © Knight Frank LLP 2015 - This report is published for general information only and not to be relied upon in any way. Although high standards have been used in the preparation of the information, analysis, views and projections presented in this report, no responsibility or liability whatsoever can be accepted by Knight Frank LLP for any loss or damage resultant from any use of, reliance on or reference to the contents of this document. As a general report, this material does not necessarily represent the view of Knight Frank LLP in relation to particular properties or projects. Reproduction of this report in whole or in part is not allowed without prior written approval of Knight Frank LLP to the form and content within which it appears. Knight Frank LLP is a limited liability partnership registered in England with registered number OC305934. Our registered office is 55 Baker Street, London, W1U 8AN, where you may look at a list of members’ names.